This is supposed to proceed 'the second coming of jesus christ, when he returns to set up his kingdom on earth'. We will say categorically that it ain't going to happen. Even after all 'nine specific prophesies' have been met there will be no second coming. 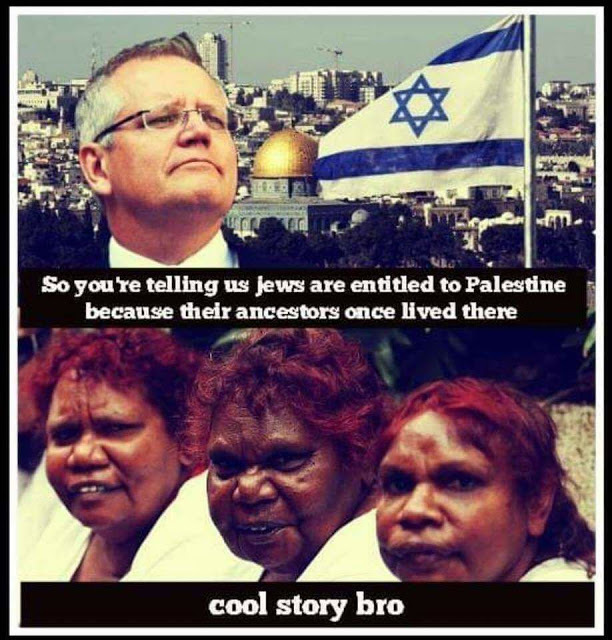 Morrison will still be waiting. How do we know this? Consider this? An alleged 'god' entity creates a planet where almost every creature has to kill and eat other creatures to survive. Then this cosmic butcher somehow loses control of his horrendous little planet to a 'satan' entity that could only have been originally created by the god entity. What an idiotic belief system? No wonder the phuktards are always abusing children? So it's a myth, and because people who believe in myths have been slaughtering each other for thousands of years humanity needs to call then out in the 21st Century. We don't accept Trump and baby-Trump Scott Morrison's fake Armageddon philosophy. Grow-up idiots and look at the real problems for a change? Inside Tasmania opposes all forms of group psychopathy. That includes the current government who inherited the Tasmanian genocide and benefit from a colonial political system. Inside Tasmania is protected by international law covering free speech and freedom of expression. Sitting at the front bar of Molly Malone’s Irish pub in Devonport, Tasmania, Scott Morrison is at ease. He is talking to Mac Jago, a worker at Cement Australia, one of the north-west’s big employers. The pair sink a couple of Boag’s ales, and make small talk. Morrison is on the offensive, campaigning in the Labor-held seat of Braddon, one of a clutch of marginal seats the government hopes it can wrest back at the 18 May election. It is a sign of his confidence, or at least his belief, that the Coalition can cling on to government. A few months ago, the prospect of the Coalition hanging on to power seemed an absurdity, but now strategists on both sides are gearing up for a fierce contest. However, it’s still early days in the campaign. Morrison’s first order of business once he assumed the role of leader last August was to patch up a bruised and battered party. Reading this soft article, one would think that The Guardian has become a right-wing news "service". No, it has not turned away from the left, it was NEVER an organ of the left. The Guardian is the Bogan middle-right voice for the dead people living in the shire with a barking dog and three kids, a stink boat on a trailer parked on the lawn of a leafy estate, and a stinking 4-wheel drive parked under the carport while the missus'car, possibly an inflated Toyota — a Lexus — is parked in the garage. They go to the local happy-clappy church on Sundays for guidance — and THEY CERTAINLY DON'T BELIEVE IN GLOBAL WARMING contrary to The Guardian, but this is only a small price to pay for being in the right wing gutter.